Something about the flavor of the cucumbers with the lime together is so good. Next time you host something, you have to make this Cucumber Limeade Party Punch…just five basic ingredients and this punch can be thrown together fast. For the best party punch experience, don’t forget the good ice! You know the kind, the small pellet or pebble style ice you can buy at Sonic in a big bag. You can sometimes find it at your local gas station or your grocery store in the Deli too. This punch is best served with a big ladle so each serving gets lots of the good ice. We love these wide mouth gallon sized glass jars from Anchor Hocking! Don’t serve this punch in one of those drink servers with the spout near the bottom where no ice comes out. When it comes to a good punch, it’s all about the ice. Serve up this refreshing cucumber limeade party punch with lots of crunchy pebble ice. 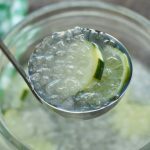 In a big glass jar with a ladle add the limeade concentrate and the cucumber slices, then add lots of pebble ice and pour in the Sprite last. The ice will melt into the punch helping to dilute the frozen juice concentrate and the sprite. Serve in a big glass jar with a ladle so every serving gets lots of ice along with the punch. You can serve this with diet Sprite if you prefer. Do you have a favorite punch to serve at parties? *Don’t miss our other favorite party punch shared by my friend Tiffany…Her awesome party punch is the champion of all party punches! You must have the sonic ice! 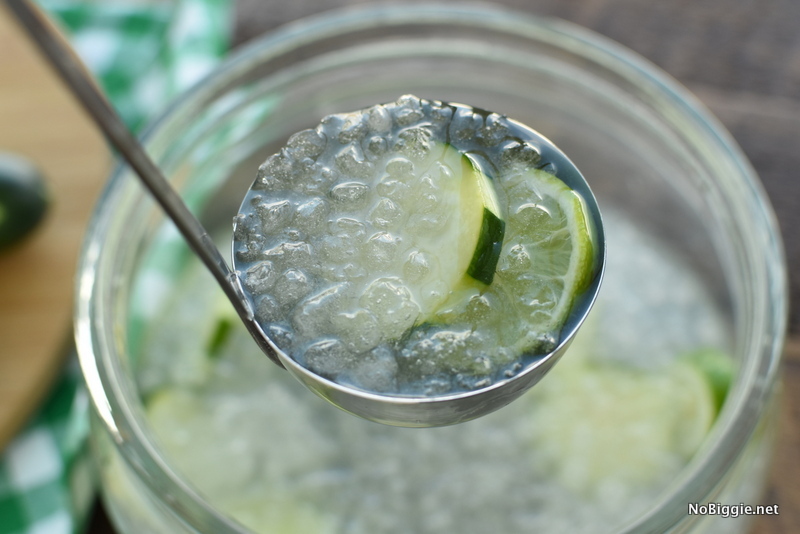 I absolutely love cucumbers in water, so I know I will love this punch! I want some now! Mmmm! Even on a cold day that looks delicious! Beautiful food presentation picture! I am craving that punch! Send some over. Sounds good…. is that a 6 oz. can of limeade? I can’t tell from the photo, it’s just the regular size you’d find in the freezer section. In the picture, it shows the 12 oz. size can of limeade, which is the regular larger one…not the tiny can. Anyine ever try with alcohol??? Which would be best? Kami, this looks wonderful. 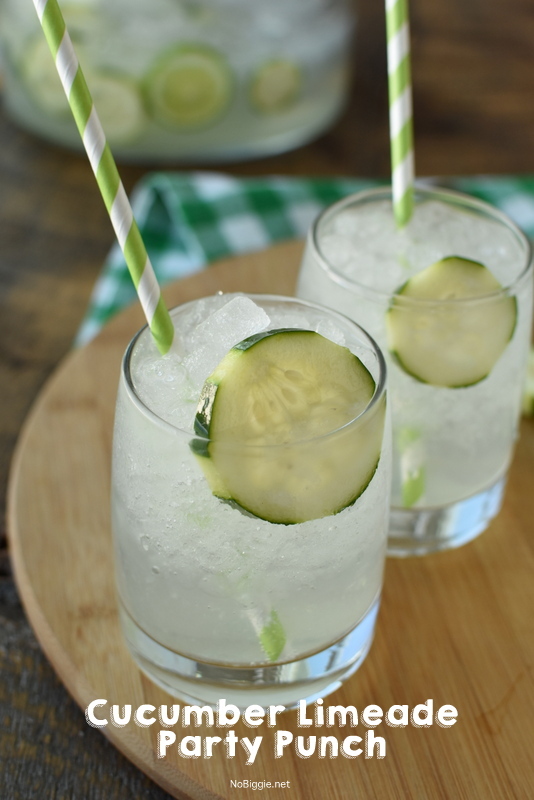 I never would have paired cucumber with Sprite and Limeade, but I love all of those ingredients, so I bet it is delicious! PINNED! Is anyone sure about the size of the limeade concentrate ? Also what alcohol might be added to this punch, VODKA? The Limeade is just the typical size found in the freezer section. As for the alcohol, I don’t drink, so I can’t help you much there, sorry. I have added a 750 ml bottle of Cucumber Vodka to this, everyone requests the recipie! What is sonic ice? Thanks for the recipe idea. I live in the middle of nowhere! Would it still be as good with crushed ice? Sure! You can totally make it without the good ice!